On the hills of Menilmontant near to the summit of Paris sits a magnificent renovated country house called the Pavillon Carré de Baudouin. Hidden behind high walls and owned for over 150 years by nuns from the Saint Vincent de Paul charity, this building, sometimes also known as the Chateau de Menilmontant, is today freely open to visitors. Transformed into a gallery and arts centre, this summer it is featuring a selection of works and photos of three well known street artists in this part of the city, and the exhibition, house and gardens make for a fascinating visit. One of the first owners, and the person who gave the building its name was Nicolas Carré de Baudouin. After inheriting the property in 1770 he asked the architect Pierre-Louis Moreau-Desproux to add a more regal façade and the two decided on neo-Palladian with four ionic columns. The house was a 'folie', a country house outside the city walls where fantastic parties were held with magnificent views back across Paris. Later the house was owned by the Goncourt family, and the two writer brothers, Jules and Edmond, apparently spent many happy childhood years here. 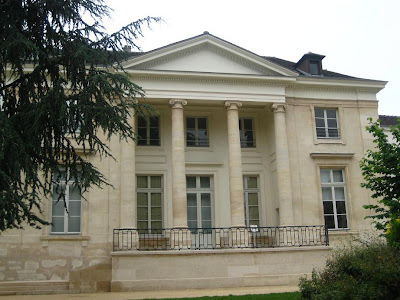 The 19th century brought more troubled times and in 1836 the house was sold to the Soeurs de Saint Vincent de Paul who built a second building along the garden and transformed it into an orphanage. 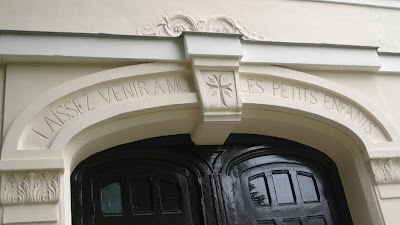 A message is still clearly visible above the entrance to the new wing; Laissez Venir a Moi Les Petits Enfants (let the little children come to me). The building kept its religious purpose until 1992 when they decided to sell. The city of Paris stepped in to save a building which was now in a sad state, and spent 4 years and over 29 million Euros renovating the gardens and buildings. The renovation, overseen by the architects Stéphane Bigoni and Antoine Mortemard, is magnificent and the building now houses large and pleasant galleries. 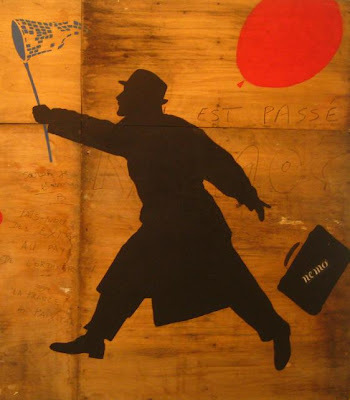 From May to the end of August this year, it is the site of an exhibition celebrating the work of three of the best known street artists in Paris; Mesnager, Mosko et associés, and Nemo. 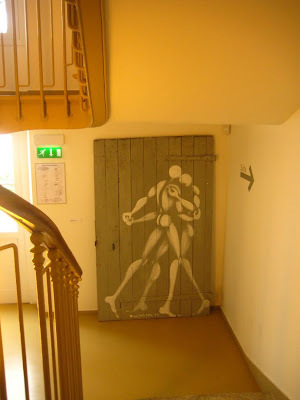 Mesnager is famous for his simple white human forms, Mosko et associés for his animals and Nemo for his black sillouettes, and the three have been spread around the building, sometimes sharing walls and frames. These figures can be seen on walls, shops and buildings around Paris, mostly in the Menilmontant area surrounding this house. It is interesting that the city of Paris have decided to celebrate them and to bring them indoors into this cosy environment. The three men clearly enjoy working together and part of the contract that brought them to this centre is that they should organise a series of workshops with local residents and groups of children. All of this contrasts very strongly with another site, La Forge, further down the hill in Belleville, subject of my next post. 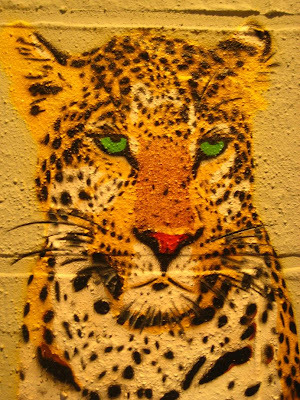 Nice to see how some of the best graffiti artists are getting more and more "established" and recognised! I almost made it to this exposition the other day when I was in Belleville, but I got distracted by too many other crazy creatures, live and otherwise! I have missed reading your posts while secluded on the Morbihan coast, so lots of catching up to do...and I will be posting more regularly again as well! Hi Adam, excellent post ! Funny, I just tore a page day before yesterday out of this week's Nouvel Obs (Tele Obs section) about the Mesnager/Nemo/Mosko exhibition, because Mesnager's name caught my eye. But I wasn't familiar with the Pavillon Carré de Baudoin. Now thanks to you and the Nouvel Obs, I'm doubly motivated to go see the exhibit. Thanks for the delightful post. I won't make it to this expo, but maybe I can do it next time I'm in the city. What wonderful illuminations to enliven the text of the city.